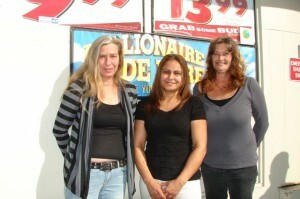 Mary Booker, left, who sold the winning ticket, with store owner Sarah Atwal, center, and employee Vicki Thomason. There was unbridled joy Wednesday at Paso Robles’ suddenly-most popular service station, 1-Stop Food and Convenience at 7th and Spring streets, as news of a $78 million lottery winner spread through the quiet downtown neighborhood. Although the big winner is not yet known, employee Mary Booker, who sold the lucky ticket, said she is excited for the store’s owners Paul and Sarah Atwal. “I can’t tell you how happy I am for Paul and Sarah,” Booker said. The Atwals, who have owned the business for a decade, will share in the win to the tune of $390,000, said Marc Bossu, the California Lottery’s district sales representative. Bossu was busily hanging “winner” signs around the establishment as people from the neighborhood crowded into the small store. Booker said she sold the winning ticket at 2 p.m. on Nov. 1. That is a particularly busy hour in the store and there were numerous lottery ticket sales at around that time, she added. “I hope it makes this person’s life better,” Booker said of the big winner. Lottery officials will announce the name of the new multimillionaire after he or she comes forward. Lottos are an excellent example of wealth redistribution! Many poor and middle class gamble, and just end up giving money collectively to a few (and the State, of course). Hey, a gamble is a gamble. It does pay out for someone, somewhere! Unfortunately the tax man cometh! It would have been so cool to win, walk into the food bank in Paso with the biggest damm check they have ever seen. Suficed to say you won’t be seeing much of me, looking forward. I hope that person realizes they won! Congratulations! Nice to see nice folks get a break! In these economic tremendously tough times, it’s nice to see some local folks literally winning the lottery. Good on them. Hopefully they will use it wisely.